Crowd-funded adhesive Stikk is a unique double sided reusable gel pad that can be washed and reused to stick anything to everything! Created from a specially formulated Polyurethane Gel Elastomer, Stikk will not damage your walls or leave a residue over your items or devices, and is suitable for holding over 300g per 3x2.5 pad. 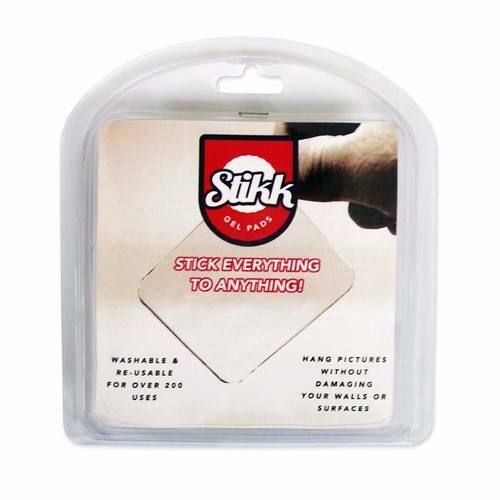 This makes stikk the ideal all-purpose quick-fix adhesive pad for hundreds of home and office uses. The clear sticky gel pads are discreet and can be easily cut down to size for a truly hidden effect. The Stikk is a fast, easy, cheap, fun, and effective solution for an unlimited number of uses, the only limit is your imagination! electricalworld.com have the pleasure of introducing this product to the UK market as the sole distributor, meaning you wont find this unique product anywhere else! Washing your Stikk double sided adhesive gel pads is simple, simply rinse the clear sticky gel pads under warm tap water and allow to air dry, and your stikk will return to its original adhesive strength. Is strong, flexible, and stays sticky after washing up to 200 times! Holds over 300g per pad! Note: effectiveness of Stikk may be reduced in high humidity areas, against rough surfaces, or on angles leaning towards horizontal. Stikk is best used on a flat surface such as glass, smooth finished walls, and smooth plastic. Bought this for hanging up a calendar inside my kitchen cupboard door, now iim using it for alot more than that. Just realised how good this product really is. I wont be using bluetach anymore! Bought these to stick a few items onto a white board for my elementary school students. I now use them everywhere and wash them too. Fantastic product. i use these all the time to show customer how something might look before i start to screw or drill something and then i take this off put it back in the packet and repeat! I love these and so does my customers who i end up usually saying - hey you can buy these online! Love these pads! Been looking for something to "soften" the edge of my laptop computer for a while, without having to carry around a long keyboard gel pad. This is perfect! I stick one side to the computer's edge, and keep the plastic cover over the other side so it doesn't stick to me. Whenever it gets a little dirty from a lot of use, it's just a simple rinse, dry & then re-use. So happy with this product! It dies what it is suppose to do too well. I use it to glue my phone lb my car's dashboard. Can be reused without losing glue. To what temperature is your products stickiness effective to? Electrical World Replies: Hello, great question. We have reached out to the manufacturer for a reply : Stikk works great in almost all temperates, high or low without changing the way it sticks. We do however advise that you reduce usage in extreme temperatures either low or high. For example, we would advise that you DO NOT use Stikk in temperatures below -16C (0F) or above 62C (150F).